Sichuan cuisine makes sense in Seattle. It rains here. It's gray, with chilly winds blowing in off the Sound to dampen our days. The warm flavors of Sichuan transport us to a more tropical climate. The spiciness jolts us out of our somnolence. The other day I went to my boy's first track meet. This spring he decided he would rather run than play baseball. The meet was chaotic, bleachers groaning with parents, everyone packed into the covered area because of a steady, cold rain that penetrated to the bone. Riley placed third in the 400 and was feeling good, but over the course of the next two hours and countless other events he stiffened up and got a stomach ache. By the time they called the 800 meter he was nearly asleep in my lap. He pulled himself up and joined the other runners. The gun sounded and Riley took off. He was easily the smallest kid in the field. Halfway around the track he made his move, taking first position at a good clip as the others fell in behind him biding their time. They rounded the halfway point and that's when I saw Riley's hand go to his stomach. He clutched at his side and I could feel the cramp spreading across my midsection too. One, two, three runners passed him. Halfway through the second lap he had fallen into last place and was clearly in pain. He jogged the final stretch as everyone waited patiently to begin the next race. I was ready for tears, to put an arm around him in the rain. But as he crossed the finish line the stands erupted into cheers and a few opposing coaches gave him high-fives. Back home while Riley warmed up in a tub I cooked a Sichuan dinner for us. Before I could even take a picture of my plate Riley had dispatched his, even the fiddleheads. He put his chopsticks down and looked up at me. "Maybe I'll try the 50 next time." I like Sichuan cuisine, have for a while. Until recently I didn't expect to ever actually try cooking it at home. But not too long ago I reached a point where I'd accumulated enough ingredients from other Asian recipes that I could at least make an attempt without needing to mount a full-scale invasion on my local Mekong Market. My first try was, no surprise, Kung Pao Chicken. Then I got a little fancier with a wild surf 'n' turf twist: Kung Pao Geoduck with Chicken of the Woods Mushrooms. The result was stellar. Experience begets experience. With a well-known classic under my belt I felt ready to make a stab at some more obscure restaurant favorites. Down the street is a hole-in-the-wall Sichuanese place called, helpfully, Sichuanese Cuisine where they make a killer Dried Chicken with string beans. For my version I used Fuchsia Dunlop's Land of Plenty as a guide. Dunlop went native to learn and collect the recipes in her book, which is focused exclusively on Sichuan Province. Unlike my local, her Dry-fried Chicken isn't battered or deep-fried, but I figured the concept was similar: chicken that is toasty on the outside and with little adornment in terms of sauce, yet succulent and flavorful on the inside. Mine added fiddleheads to the mix. I can now say that my version was definitely flavorful, though I'll need some more practice with the alchemy of Sichuan technique before I fully nail the succulent part. Rather than locking in the juices, mine just seemed dried out. 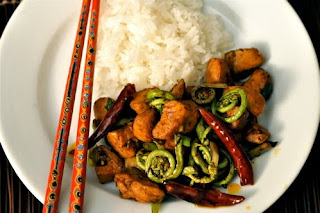 That doesn't mean you shouldn't try this recipe, because like I said it was still quite tasty, and a better wok-master than myself might find that perfect balance of heat and timing to hit the bull's-eye. The fiddleheads were my idea. I've been trying to come up with new ways to serve these cool little green scrolls that I find in the woods. 1. Heat peanut oil in wok over high flame until smoking, then add chicken and stir-fry several minutes to cook off most of meat's water content. 2. Reduce heat to medium, stir in dried chili peppers and Sichuan peppercorns, and cook until fragrant, a couple minutes. 3. Add chili bean paste, soy sauce, wine, and salt. Continue stirring until sauce has largely cooked off and the meat is toasty on the outside, 10-15 minutes. 4. Stir in green vegetables, coating with the last of the oil, and cook together a couple minutes. Off heat stir in sesame oil before serving over rice. First, what a sweet story about your son. Second, I LOVE dry-fried whatever. I've had the same problem with the recipes that call for chicken breast... I've given up, and just chicken thighs. Always juicy, and it widens the cooking window so that I can fry it until it's really crispy. Nice twist! I love dry fried green beans and asparagus, I'll definitely try this. I like your Sichuan experiment! Agreed that chicken thighs are the better cut for stir-fry. (Chicken breasts are affectionately known as "white guy meat" in our house.) You could mix the chicken chunks with a generous pinch of cornstarch ten minutes before frying, to crisp the outside and keep moisture in. Also I've abandoned my wok for the cast iron skillet ... many of the woks you get stateside don't get hot enough to do the toasty exterior you want without burning. I love fiddleheads as a stand-in for green beans or asparagus in this dish. Just gorgeous. I bet a black bean sauce would be nice with this, too. Julia - Thanks, and I'm with you: Out with breasts, in with thighs. 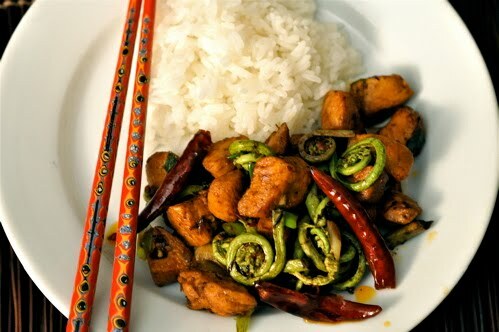 Barnaby - Dry-fried green beans are just about my favorite too, but the fiddleheads are a change-up that you'll enjoy. Audrey - I have a Joyce Chen wok, which is supposed to be decent, but what do I know? I like the corn starch idea. Maybe that helps to seal in the juices better. Thanks! Heather - A black bean sauce might be better. One thing I was thinking was that the slight bitterness of the fiddleheads needed something else as a counterweight. More experimenting necessary...ha! "2. 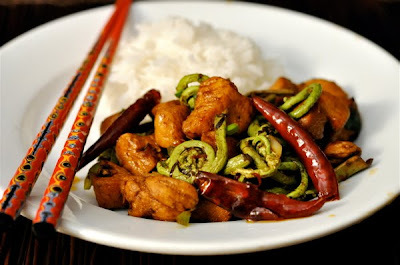 Reduce heat to medium, stir in dried chili peppers and Sichuan peppercorns, and cook until fragrant, a couple minutes." You forgot "Turn fan on warp speed and don't breath!" And some traditional recipes have you marinate the chicken/shrimp/pork/whatever in rice wine with ginger & green onion, then use a egg white & cornstarch wash to seal the meat. Then remove, proceed with the rest and add back near the end.